Hobokenites are adjusting to their fall schedules this week but some readers noticed a trend and reached out noting commenters on MSV are getting notice outside of the usual circles of government and Mile Square readers. 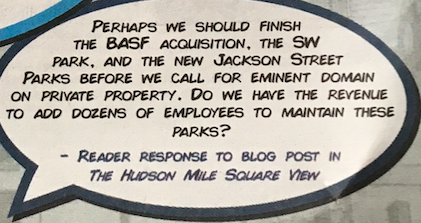 An ad on behalf of Academy Bus appearing over the weekend continued a series in opposition to the City of Hoboken demonstrating an eminent domain appetite for one acre of its land showing comments by MSV readers featured in consecutive weeks. The comments by MSV readers have been a centerpiece of the full page ad seen below. 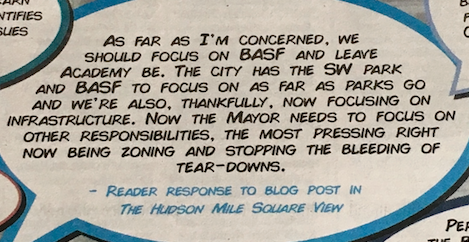 Two of the main comments are the most substantial featured in the ad on a budding eminent domain controversy in the middle and lower right. Even during the dog days of summer, MSV commenters have found their way beyond City Hall and regular readers; it's a Sign of the Times.